Below are brief biographies of key U.S. commanders, including the top military commanders at U.S. Central Command, which oversees U.S. military operations in the Persian Gulf, and the Joint Chiefs of Staff at the Pentagon. 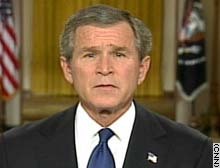 Civil experience: Bush was the governor of Texas from 1995 up until his election as president in 2000. Military service: Bush served in the Texas Air National Guard from 1968 to 1973 as a F-102 pilot. Command: As defense secretary, Rumsfeld is the principal defense policy adviser to President Bush and is responsible for general defense policy and policy related to all matters of direct concern to the Department of Defense. Civil experience: Rumsfeld previously served as defense secretary in the Ford Administration from 1975 to 1977. Before that, he was White House chief of staff under President Ford and the ambassador to NATO. In the Nixon administration, he served as a counselor to the president and director of the Office of Economic Opportunity. Rumsfeld also was an elected official, serving as a congressman from Illinois in 1962-1968. 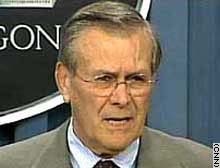 Military service: Rumsfeld was a U.S. Navy pilot from 1954 to 1957. 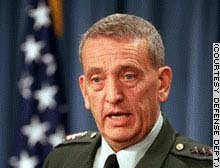 Command: Until his retirement in July 2003, Franks was the commander-in-chief of U.S. Central Command (CENTCOM), one of the Defense Department's nine unified commands, overseeing U.S. security interests in the 25 countries of the Middle East, central and southwest Asia, and northeast Africa. 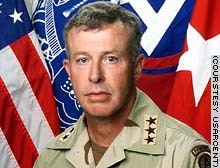 Franks assumed command of CENTCOM in June 2000 and commanded the U.S. forces in Iraq and in Afghanistan during the ouster of the Taliban following the September 11, 2001 terrorist attacks. Years of service: Commissioned as a second lieutenant in 1967 after graduating from the Artillery Officer Candidate School at Fort Sill, Oklahoma. 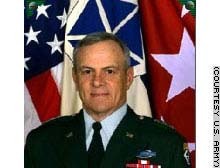 Previous commands: He headed the 2nd Infantry Division in Korea from 1995 to 1997 and then assumed command of the 3rd Army/Army Forces Central Command in Atlanta, Georgia, in May 1997. Combat experience: Served as a forward observer and fire support officer in Vietnam and was the assistant division commander for the 1st Cavalry Division during Operation Desert Storm. Command: Gen. John Abizaid was named commander of U.S. Central Command on July 7, 2003, following the retirement of Gen. Tommy Franks. Abizaid is one of the most senior U.S. military officers of direct Arab descent, born in the United States of a Lebanese family. As the head of CENTCOM, Abizaid is the point man for operations inside Iraq and U.S. military relations in the Muslim world. CENTCOM is one of the Defense Department's nine unified commands, overseeing U.S. security interests in the 25 countries of the Middle East, Central and Southwest Asia, and Northeast Africa. Years of service: Abizaid graduated from the U.S. Military Academy in June 1973 and was commissioned a second lieutenant. He began his career with the 82nd Airborne Division at Fort Bragg, North Carolina. Previous commands: Abizaid has led the 1st Infantry Division, the 82nd Airborne's 504th Parachute Infantry Regiment and was the 66th commandant at the U.S. Military Academy. Abizaid was director of the Joint Staff, a powerful organization that serves the Joint Chiefs of Staff, until he was named deputy commander of Central Command in February 2003. He was promoted from lieutentant general to four-star general when named CENTCOM commander. Combat experience: Abizaid led a Ranger rifle company during the invasion of Grenada and deployed to northern Iraq with the 3rd Battalion, 325th Airborne Battalion during the Persian Gulf war. Command: Lt. Gen. DeLong is the deputy commander of U.S. Central Command stationed at MacDill Air Force Base in Tampa, Florida. Years of service: DeLong graduated from the Naval Academy in June 1967 and was commissioned as a second lieutenant. 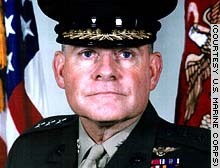 Previous commands: DeLong commanded the 3rd Marine Air Wing at Miramar Marine Corps Air Station in California; was deputy commanding general of the 1st Marine Expeditionary Force; deputy commander and Acting Commander, U.S. Marine Corps Forces, Atlantic, and his previous duty as commander of the 3rd Marine Air Wing. Combat experience: DeLong served in Vietnam, including tours with a Marine helicopter squadron and participated in Operations Eagle Pull and Frequent Wind, the U.S. evacuations of Vietnam. He has logged more than 800 combat hours. Command: Lt. Gen. Ricardo S. Sanchez assumed command of the Army's V Corps on June 14, 2003. As commander of Coalition Task Force 7, he is the leader of all U.S. ground forces in Iraq. Years of service: Lt. Gen. Sanchez was commissioned a second lieutenant of armor after graduating from Texas A&I University in 1973. Previous commands: Before commanding V Corps, Sanchez was commanding general of the 1st Armored Division, which is part of V Corps. Sanchez also has led the 2nd Brigade, 1st Infantry Division and served as an investigator at the U.S. Army Inspector General Agency's office in Washington, D.C.
Based: V Corps is based in Germany but Sanchez is currently based in Baghdad. Combat experience: Sanchez commanded an armor battalion in the 1991 Persian Gulf War. Command: Gen. Moseley is commander of the U.S. Ninth Air Force, which covers six wings in the eastern United States. He also is the commander of U.S. Central Command Air Forces, giving him the responsibility of planning and conducting air operations in the Persian Gulf region. 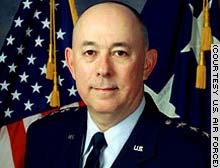 Years of service: Moseley joined the Air Force in 1971 while a student at Texas A&M University. Previous commands: Moseley has commanded the F-15 Division of the Air Force Fighter Weapons School at Nellis Air Force Base, Nevada; and the 33rd Operations Group at Eglin Air Force Base, Florida. He also has served as the director of Operations for Joint Task Force-Southwest Asia, and commanded the 57th Fighter Weapons Wing at Nellis Air Force Base, the service's largest, most diverse flying wing. Command: Lt. Gen. Earl Hailston is the commander of U.S. Marine Corps Forces Central Command, overseeing all Marine Corps units in Central Command's 25-nation area of responsibility, including the Persian Gulf. 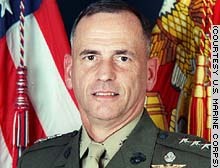 He also is the commander of Marine Corps Forces and Bases Pacific. He assumed his current assignment on August 10, 2001. Years of service: Hailston enlisted in the Marine Corps in 1967. Following graduation from boot camp, he was assigned to the 2nd Marine Division for duty as an infantry rifleman and received his officer's commission in 1968 through the Enlisted Commissioning Program. Previous commands: Before his current assignment, Hailston was commander of the II Marine Expeditionary Force and Marine Corps Bases Japan. He also served as the commanding general of 3rd Force Service Support Group in Okinawa, Japan. Earlier in his career, as lieutenant colonel, he was the commanding officer of Marine Fighter Attack Squadron 312. Combat experience: Hailston served in Vietnam with the 1st Reconnaissance Battalion, 1st Marine Division. 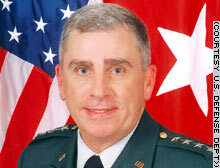 Command: Lt. Gen. William S. Wallace commanded the Army's V Corps from July 18, 2001 to June 14, 2003. As V Corps commander, he led U.S. ground forces during major combat in Iraq in March and April 2003. He is now the commanding general of Fort Leavenworth, Kansas, and the Army's Combined Arms Center located there. Years of service: Lt. Gen. Wallace graduated from the U.S. Military Academy in 1969 and was commissioned a second lieutenant in the Armor branch. Previous commands: Before commanding V Corps, Wallace commanded the Joint Warfighting Center and was director of Joint Training at the U.S. Joint Forces Command. He also has commanded the Army's 4th Infantry Division and the Army's National Training Center. Combat experience: Wallace served in Vietnam as an assistant district adviser and later as operations adviser in the Bac Lieu Province. Command: Lt. Gen. McKiernan is the commanding general of the 3rd U.S. Army, U.S. Army Forces Central Command (USARCENT) and the Coalition Forces Land Component Command (CFLCC). 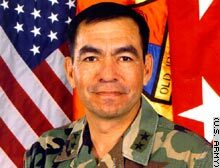 As CFLCC commander, he was in charge of all coalition land forces in Iraq until that authority was transferred from CFLCC to Coalition Joint Task Force 7, led by Lt. Gen. Ricardo Sanchex, in mid-June 2003. McKiernan assumed command of the 3rd Army and CFLCC on September 4, 2002. Years of service: Lt. Gen. McKiernan entered the Army in 1972, receiving an ROTC commission from the College of William and Mary. Previous Command: Before his current assignment, McKiernan was the Army's deputy chief of staff for operations in Washington, D.C. He also commanded the 1st Cavalry Division from October 1999 through October 2001 in Fort Hood, Texas. Wartime service: In December 1990, Lt. Gen. McKiernan was attached to VII Corps headquarters to run the corps tactical command post during Operations Desert Shield and Desert Storm. Command: Keating is the commander of the U.S. Fifth Fleet and the U.S. Naval Forces Central Command. He started on February 10, 2002. Years of service: Keating, a native of Dayton, Ohio, graduated from the United States Naval Academy in 1971. 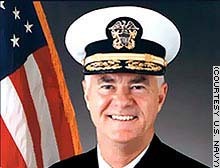 Previous Command: Keating served as deputy chief of Naval operations for plans, policy and operations from September 2000 to February 2002. Before that, he commanded Carrier Group 5 based in Yokosuka, Japan, starting in June 1998. Wartime service: During Operation Desert Storm, Keating was deputy commander, Carrier Air Wing 17, participating in combat operations in from the aircraft carrier USS Saratoga. Command: Harrell is commander-in-chief of Special Operations Command Central, which is responsible for planning special operations throughout U.S. Central Command's area of responsibility. Years of service: He was commissioned through the Army ROTC program at East Tennessee State University in 1973. Previous commands: After qualifying for Special Forces in 1977, he led a Special Forces A-team in Panama and commanded an airborne rifle company in the 82nd Airborne Division. Combat experience: Harrell served in Operation Urgent Fury in Grenada, Operation Just Cause in Panama and Operation Desert Storm. He was wounded by mortar fire in 1993 as part of Task Force Ranger in Somalia, where he was the overall ground commander during the firefight portrayed in the movie "Black Hawk Down." Headquarters: MacDill Air Force Base, Tampa, Florida.